Make that love connection. 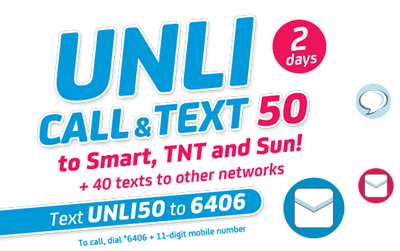 Stay in touch with all of your friends and love ones with Smart Prepaid Unli Call & Text Promos offers! Now, you can even enjoy call and text like there’s no tomorrow. Choose from these features that suites your needs and wants. and must have P1.00 maintaining balance is required. Visit www1.smart.com.ph for more details and get the latest updates.